Sleep in and overnight in Cork City and kiss the Blarney Stone! Check in for 2:00 pm departure from Heuston Station (please check in 20 minutes prior to departure). Arrive Cork Kent Station at 4:40 pm. Transfer to your 4 * standard Hotel in Cork City Center. You have the evening free. Overnight Stay: Cork City Center. Enjoy your Full Irish Breakfast at your leisure and we will pick you up from your hotel at 9:20 am, hotel reception. 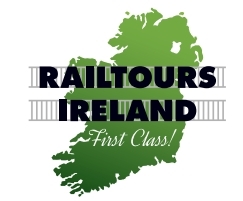 We transfer to Cork Kent train station where we meet our group arriving from Dublin and transfer to our Railtours Ireland tour coach through Cork City to Blarney Village and historic Blarney Castle and Gardens, built in 1446 by Dermot McCarthy. You will have time to kiss the famous stone, which is said to bestow the gift of eternal eloquence on those lucky enough to do so. There is also time for shopping and lunch at Blarney and we recommend that you have lunch there, as this will be the only opportunity during the day to have a substantial meal. 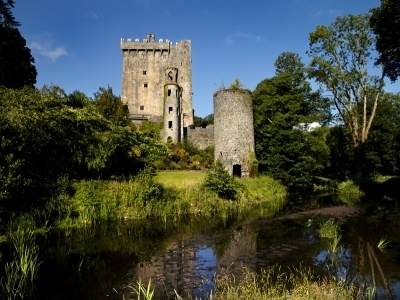 Depart Blarney Castle for Cóbh, via the city center and a short city tour. On arrival at Cóbh we will visit St Colman’s Cathedral. We will then proceed down along the sea front passing the former White Star Line offices en route to the beautifully restored Victorian railway station/transatlantic terminal. This is now the Cóbh Heritage Centre, home to the Queenstown Story. The center also houses much information about the Great Famine and subsequent Irish Emigration; 3 million Irish people emigrated from Cóbh, (principally to the United States) including Annie Moore, whose statue is located in front of the heritage center. 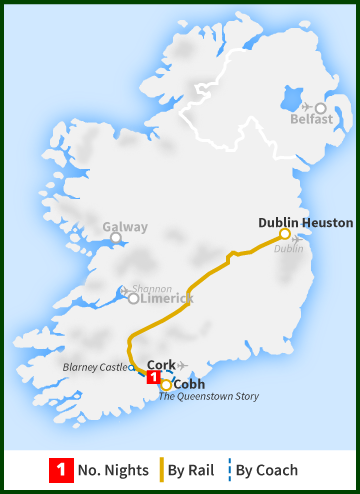 Depart Cobh by train to return to Dublin, returning to Dublin Heuston Station at 8:00 pm.